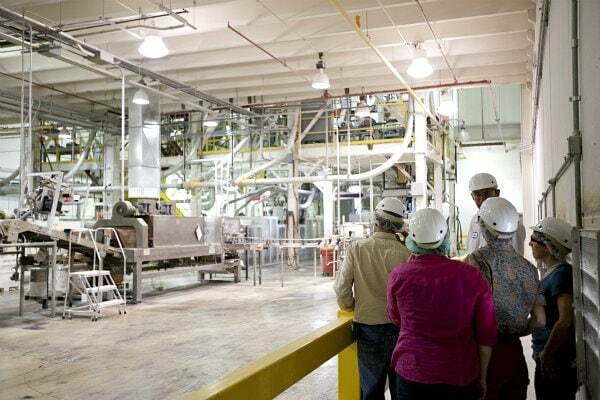 In the middle of my family’s cross country summer road trip, I took on an opportunity to visit the headquarters of Gold Medal Flour– their farms and their mill in Kansas. 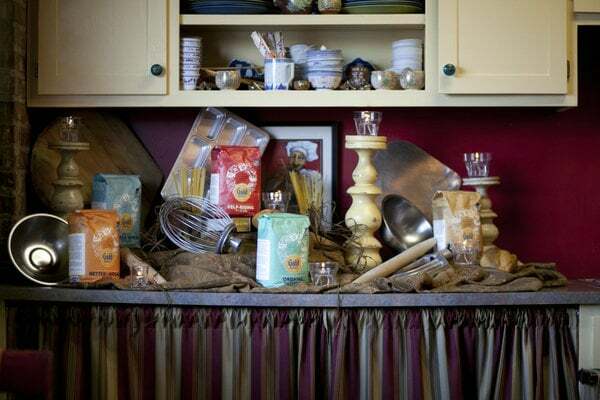 I have the opportunity to work with the very nice folks at Gold Medal Flour this fall to create some new recipes! 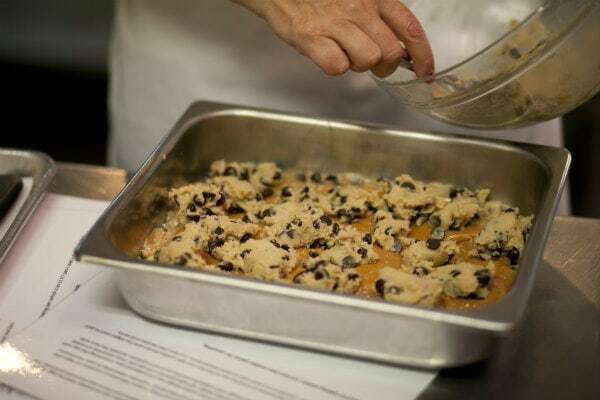 So… you know what that means… new baked goods recipes- coming your way– this fall! Our first stop was visiting a wheat farm- so we could learn first-hand — from a 4th generation farmer– the process of how wheat is transformed into flour. The farm was in the middle of Kansas. Totally in the middle of Kansas. Like… I-can’t-imagine-living-way-out-there-in-the-middle-of-all-of-those-wheat-and-corn-fields Kansas! But it really was beautiful (though very hot and windy). Driving through the country like that… seeing all of the big silos used to store grain and both small and large family farms everywhere. That’s a different life, for sure. 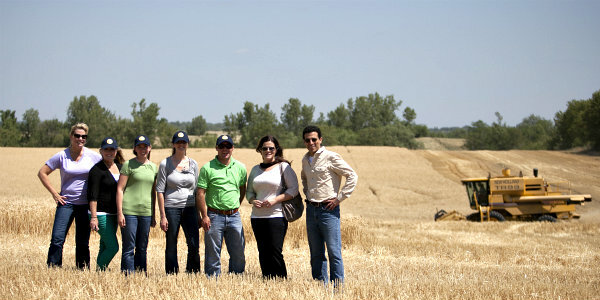 There were a few of us food bloggers there… don’t we look rugged and ready for harvesting wheat? Like naturals, right? 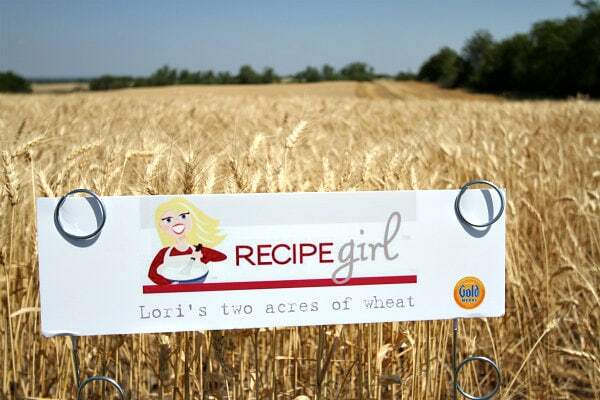 A fun little surprise: a sign displaying my two acres of wheat. 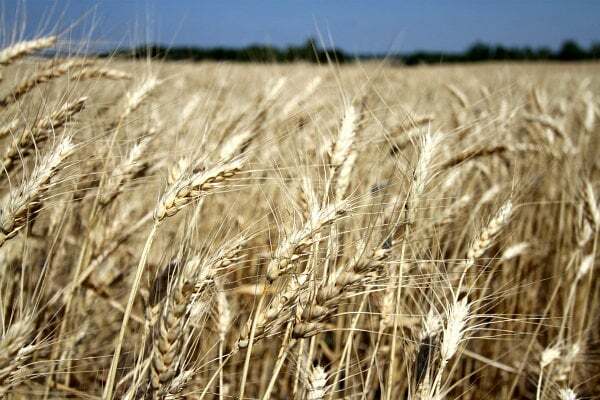 I began to have visions of moving to Kansas, purchasing my own farm, raising chickens, tending to the land and turning my husband into a wheat farmer. 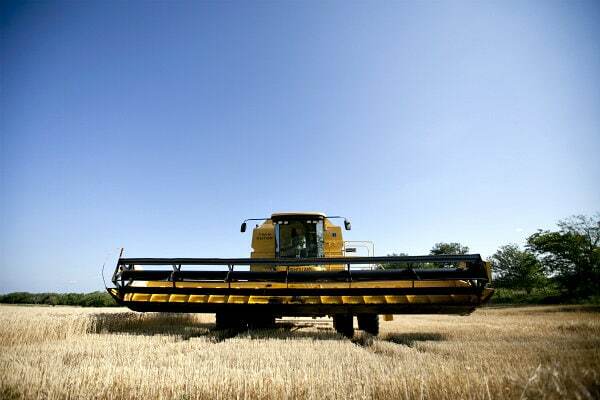 And then I saw the combine! This thing is as massive as it looks. Here’s the part where my dreams of moving to Kansas and becoming a wheat farmer’s wife were crushed. My husband has terrible allergies. This job isn’t for him. …and then it delivers the wheat kernels into a large truck for transport to the mill. “General Mills” is actually a “mill” in Kansas City. 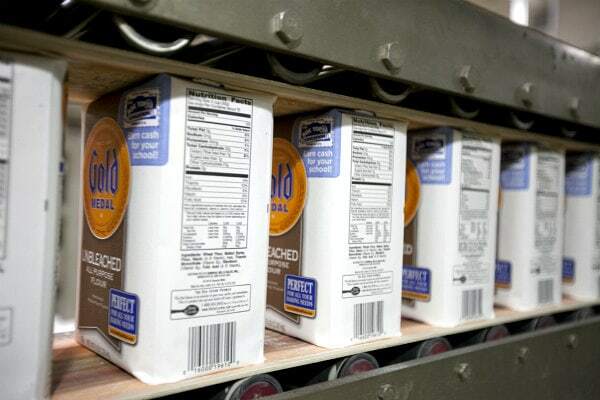 This is where the wheat berries are ground into flour and then it’s all packaged and ready for distribution. The milling process is quite involved, and it involves 7 or so floors of equipment. There is grinding and re-grinding and separating and testing. Lots of tubes and pipes and scientific poking and measuring. It’s amazing that anyone ever figured out how to make flour in the first place. Eventually, those wheat berries are turned into sprinkles of flour, and then they’re ready for packaging. The whole process from farm to table was very interesting. Everyone from the farm to the mill is pretty passionate about what they do too. 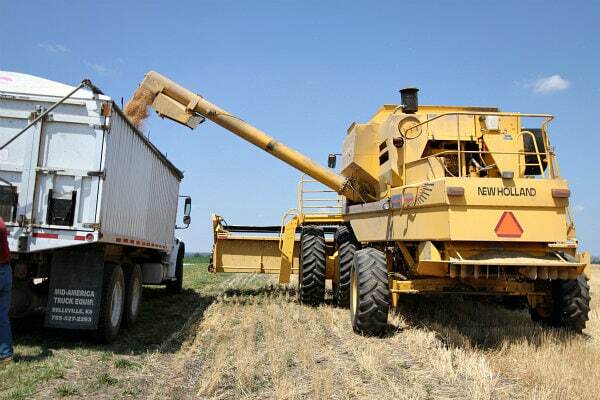 One farmer told me, “If you’re born into wheat harvesting… then you’re gonna be a next generation wheat farmer. That’s just how it is.” He also told me that he loved what he did. 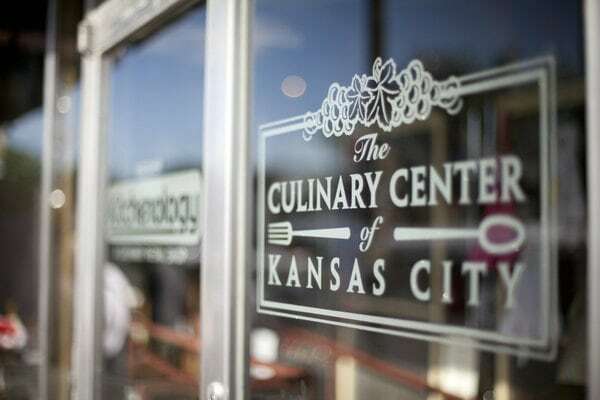 We took our flour and headed to the Culinary Center of Kansas City, where we were met with a surprise. It was time for a bake-off! 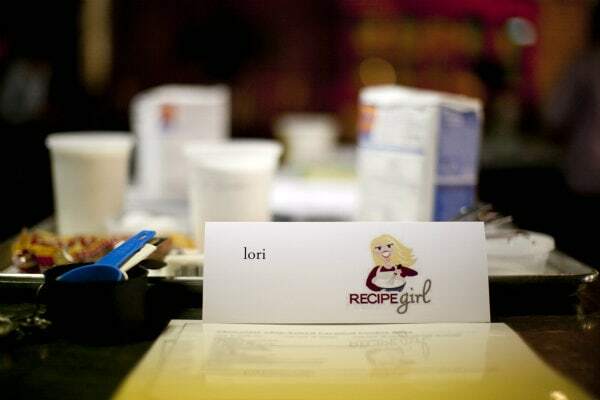 I found a table with my name on it, a bunch of ingredients, and a recipe that I was asked to make. The recipe was for Two Peas and Their Pod‘s Salted Caramel Chocolate Chip Cookie Bars (lucky me!). Of course, they were incredible- and easy to make too! Here’s a peek at some of the hip, new packaging that you’ll soon begin seeing in your grocery store. 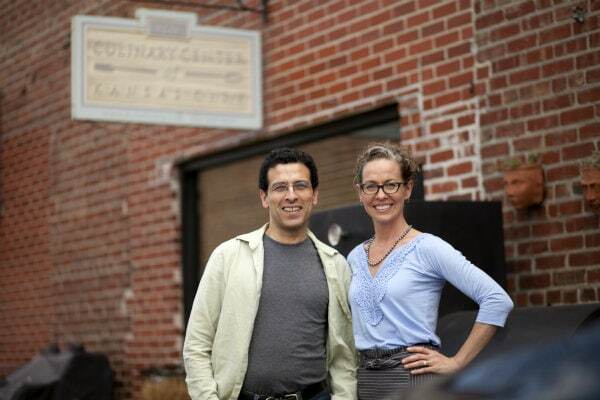 I was THRILLED to meet Jeff and Zoe from Artisan Bread in Five Minutes a Day for the very first time. Loved both of them, and they are a wealth of knowledge and talent about all things bread and pizza! My other fun blogging girlfriends! 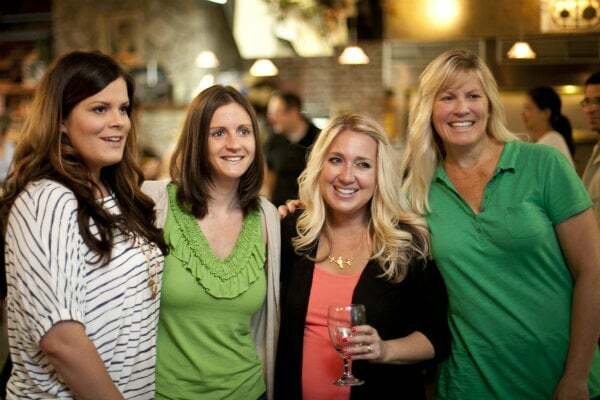 ~ Jamie (My Baking Addiction), Maria (Two Peas and Their Pod) and Jenny (Picky Palate). 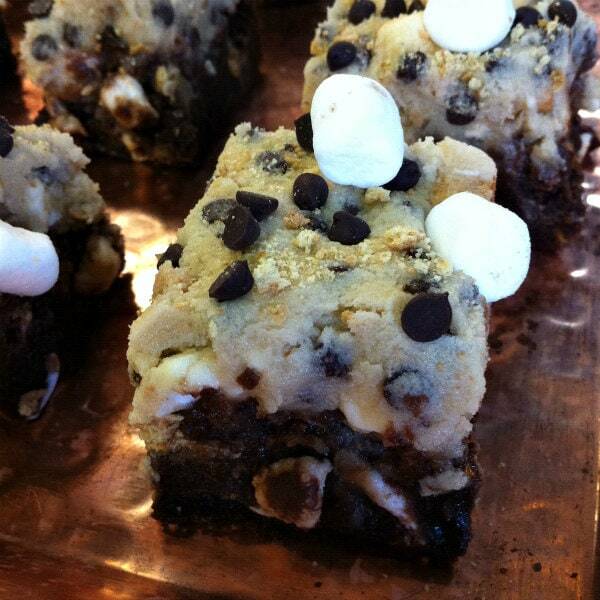 Jamie was given the task of making my Chocolate Chip Cookie Dough Brownies (and she added a few marshmallows and graham crackers to make them S’More-like). 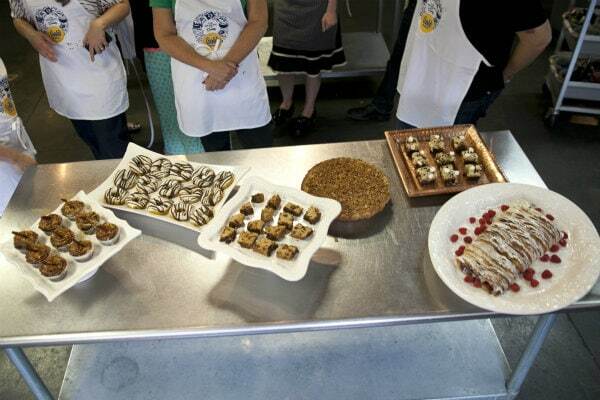 There are all of the goodies we were tasked to make- cupcakes, donuts, pie, and pastry! And here’s our whole team, including Maegan (2nd from left) who will be starting a blog for Gold Medal Flour called Baker Mama, and Josh & baby Caleb who are the rest of Two Peas and Their Pod. Here’s a little video sharing my experience from Farm to Table with Gold Medal Flour! Thanks to Gold Medal Flour for educating us about the process of harvesting and milling wheat. It was such a fun trip! *Some of the photos displayed above were given to me by Gold Medal Flour’s photographer. 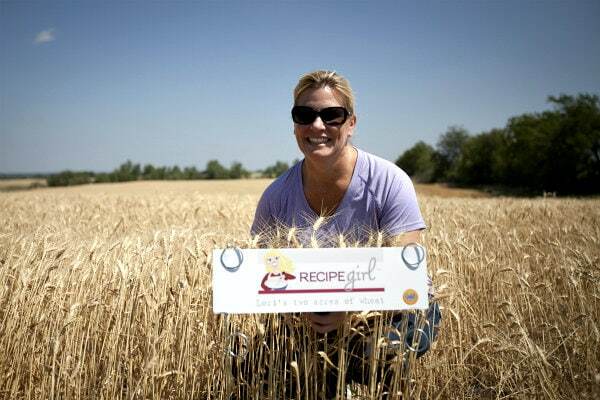 How fun that you were in KS and got the great experience of our many wheat fields. I grew up in KS! 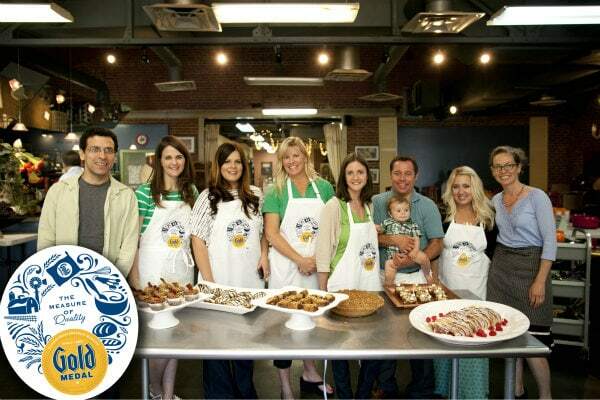 The bake off at sounds like it was fun, I would love to have an experience like that! 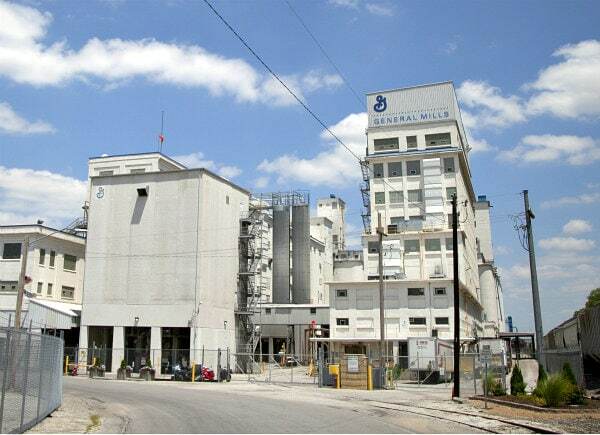 I thoroughly enjoyed this article and learning about the flour process. I wonder too who figured out how to make flour from wheat! How exciting to see all these awesome pictures of Kansas! I live in Kansas and have never taken the time to learn how flour gets from the plant to our table, so thank you sooooo much! What are the other goodies on the table? I am especially curious about the one with the raspberries. Looks like you all had a good time. I’ve really enjoyed reading about your cross country adventures. I was giggling while you were describing the wide open spaces and then when you decided you might like to actually become a wheat farmer…I gueesing you have never seen our wide open spaces and our rural areas and farms except when rdriving the interstates… thanks for making my day..we love our country life in South Dakota also and wouldn’t trade it for anywhere else. Loved this post. It brought back a lot of memories of Bruce’s summer visits to Kansas and the great stories he shared about harvesting wheat. Thanks for sharing your experience too. Good job! Super sad I missed you for lunch the first day everyone arrived! Can’t WAIT for your recipes this fall. My mouth will dance. It looks like you had a lot of fun. There are a lot of great food sites in Kansas. Glad you got to visit! Yes! We had some great BBQ while we were there. Can’t remember where, but tried all kinds of wonderful ribs! What a fun trip and fabulous pictures!! Such a cool experience too! What a great tour and day in Kansas. I love that you all baked each others recipes. 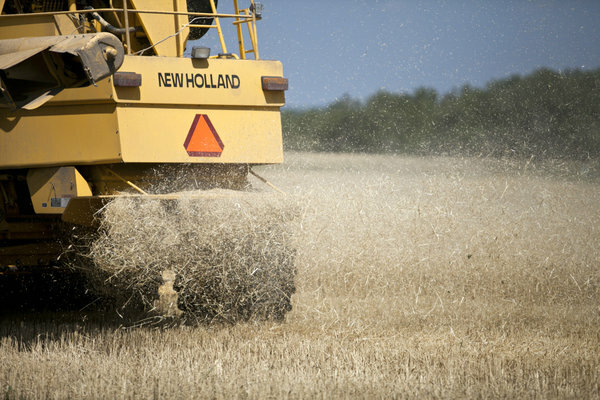 You’re all too dressed up to be naturals at farming… but then I’ve only helped on a ranch and I’m sure things aren’t quite as messy in a wheat field!